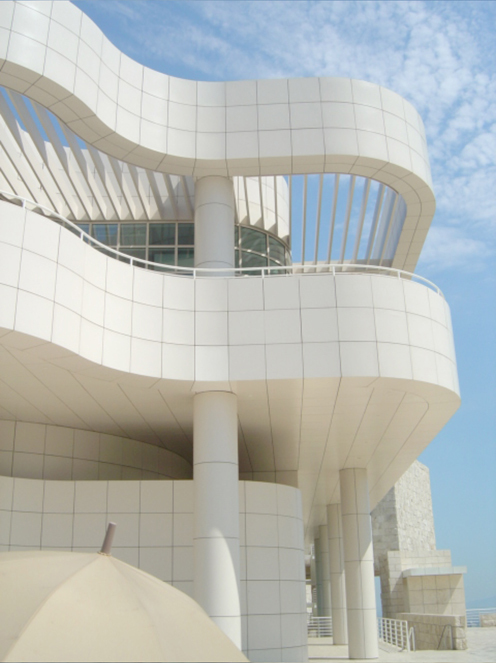 It is hard to miss the Getty Center in Los Angeles, California. I remember when I was driving along the San Diego hi-way to see it for the first time – the moment I saw a cluster of stark, white buildings on top of a hill, I knew that was it. Even though its dominant color is not close to any earth tone, the complex still appears as I it grew out of the site. The buildings are organized and massed in such a way that they almost follow the natural contours of the hillside that it is perched on. From a centralized parking area, I was taken to the top of the hill by a computer-operated tram. At the central arrival plaza, the whole symphony of Meier’s travertine and aluminum buildings could be better appreciated while enjoying breath-taking panoramic views of the city. The Getty Center is comprised of the Getty Conservation Institute, the Getty Education Institute for the Arts, the Getty Grant Program, the Getty Information Institute, the J. Paul Getty Trust, the Getty Research Institute for the History of Art and the Humanities, the J. Paul Getty Museum, an auditorium, central garden, and several cafes and restaurants. All these buildings are organized along a natural ridge on the hilltop and around a series of courtyards and terraces. The vicinity is surrounded by high-end subdivisions with powerful people living in them. They requested that all the structures in the complex be no more than two stories high so the buildings won’t appear as if they were towering over their residences. The need for space was answered by extending the buildings underground and linking them with subterranean corridors that facilitate the moving of artwork and other materials. The buildings are organized by a perfectly oriented north-south grid with a 3ft by 3 ft module, which clearly expresses the cubist beliefs of Meier. The museum is divided into five galleries or buildings, called pavilions, are North, East, South, West and the Changing Exhibit pavilion. These pavilions are clustered around a central courtyard. Though these five galleries are all connected by glass-covered bridges which make the transition from gallery to gallery easier, the visitor still has the option of coming out into the courtyard to skip a gallery and move on to his preferred one. The visitor therefore has freedom to move about the galleries in whatever sequence he wishes, unlike most museums, where people are required to take the prescribed flow. 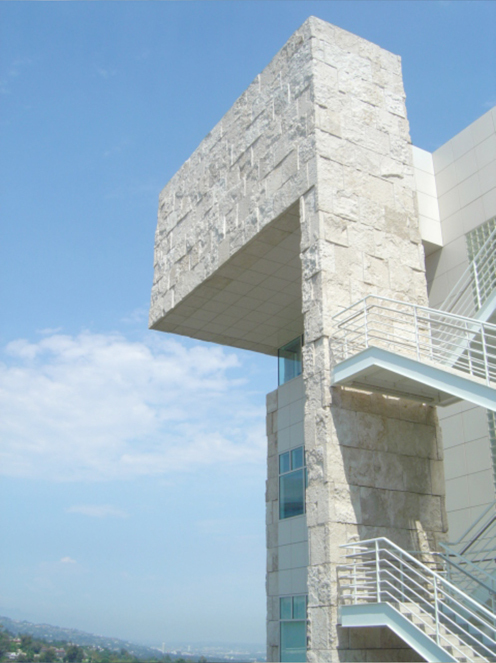 The characters and shapes of the different buildings of the Getty Center. The artwork is displayed throughout the pavilions chronologically: the North houses the oldest art while the West houses the newest. The first floor galleries house light-sensitive art, such as illuminated manuscripts, furniture or photography. 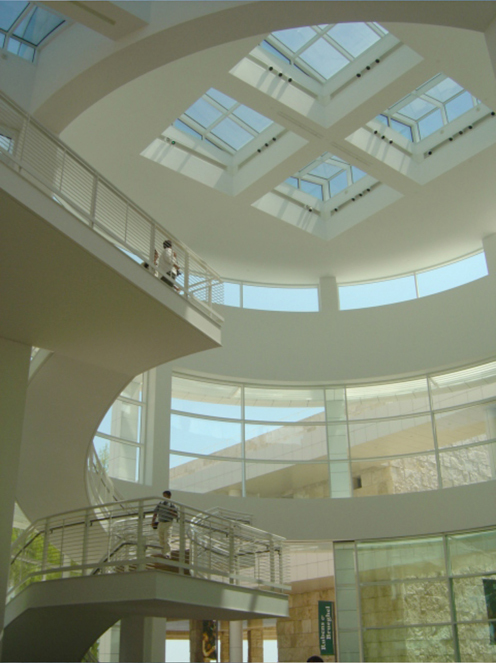 Computer-controlled skylights on the second floor galleries allow paintings to be displayed in natural light. 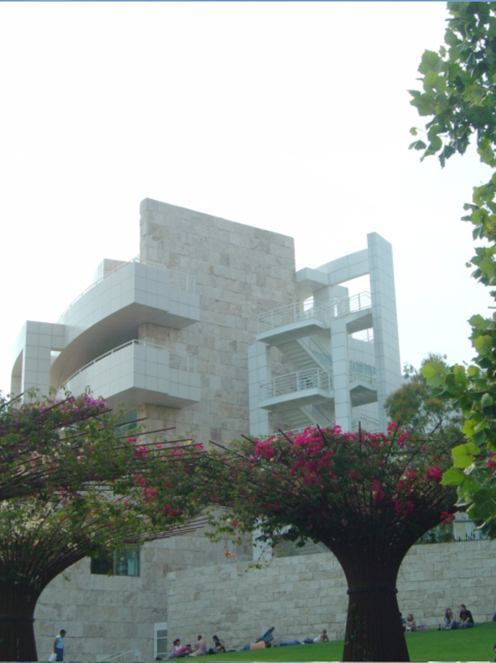 To the west of the Central Garden is the Getty Research Institute (GRI). This circular building is used primarily by Getty scholars, staff, and visiting researchers. The library evokes the introspective nature of scholarly research, with book stacks and reading areas wrapping around a central courtyard. A ramp creates concentric paths, promoting interaction among the scholars and staff. A skylight pulls light through to the subterranean reading room. At the plaza level, a small exhibition gallery displays objects in the GRI’s collection for visitors. To the north and east of the Arrival Plaza are the Getty Grant Program, the Getty Conservation Institute, and the J. Paul Getty Trust administration offices. Intimate sunken gardens, terraces, glass walls, and open floor plans provide fluid movement between indoor and outdoor space, and views of Los Angeles for Getty staff. 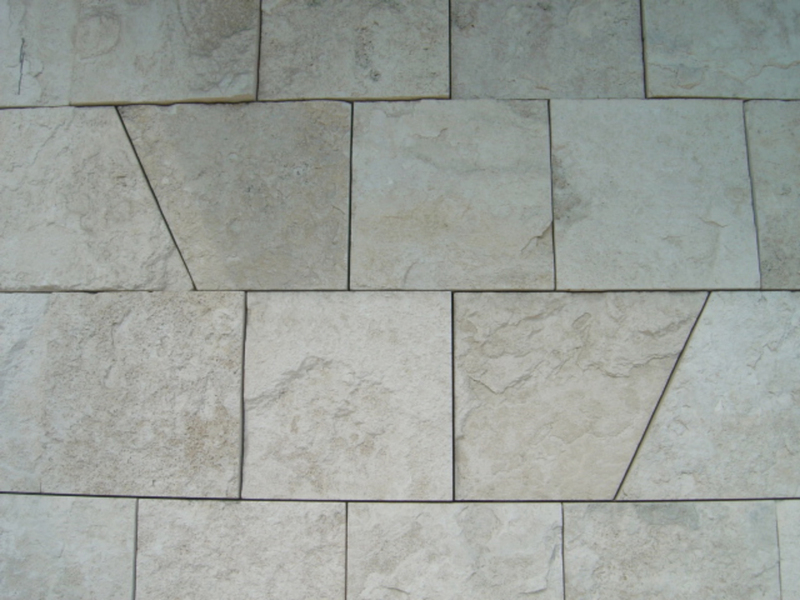 One of the most remarkable elements of the complex is the travertine stone that was used to clad most of the buildings. 16,000 tons of stone were quarried from Tivoli, Italy, 15 miles east of Rome. They claim that this is the same kind of stone the Romans used to build the Coliseum. To make the complex different, Meier and his staff worked for a year with the quarries to invent a process using guillotine to produce a unique finish. TRAVERTINE STONE CLADDING - 16,000 tons of stone were quarried from Tivoli, Italy, 15 miles east of Rome. They claim that this is the same kind of stone the Romans used to build the Coliseum. To make the complex different, Meier and his staff worked for a year with the quarries to invent a process using guillotine to produce a unique finish. Meier has also been known for his expert use of natural light. The many exterior walls of glass allow sunshine to illuminate the interiors. A computer-assisted system of louvers and shades adjusts the light indoors. The galleries of paintings on the Museum’s upper level are all naturally lit, with special filters to prevent damage to the artworks. USE OF NATURAL LIGHT - exterior walls of glass allow sunshine to illuminate the interiors. A computer-assisted system of louvers and shades adjusts the light indoors. To me, The Getty is certainly one of the best designed museums in the world with its interior ambience that is perfect for appreciation of art, its lay-out which allows an efficient flow of visitors, and the placement of buildings which creates exterior public spaces that blend seamlessly with the landscape.